I definitely would like to have one because I wanna be like Ruth (and Debra Lee)! Succulents are such great plants to work with. I love how they multiple so easily and quickly. Working them into a garden design is pretty amazing also… mixing varieties as well as throwing in other plants such as palms and bamboo adds to the whole “picture”. I’m in Hawaiian native plant conservation here on the Big Island of Hawaii and get to work with a few native and endangered Hawaiian portulacas. Having this book in my collection would inspire me even more in my already passionate line of work. Also to inspire me further to pursue my side business, Waterwise Hawaii – promoting xeriscape landscape design with both succulents and native plants on our west side of the island, where rainfall is very minimal. It would be an honor to own a copy of this book because I love everything succulent and still have so much to figure out after being obsessed for over 4 wonderful years. And one can never stop learning; ever. I would like a copy of the book to learn more about growing a dry garden and help promoting the dry garden in Australia. Have become a succulent addict and slowly converting my garden to a dry climate garden. Would ultimately like to visit America and tour around a lot of nurseries and the Ruth Bancroft garden. Debra Lee Baldwin and Laura Eubanks two of my biggest inspirations so far. With the climate change upon us & if this past summer is any evidence of what’s to come, we need to learn what to plant that required less water. Also, we need to be conserving water daily. I’m always looking to expand my knowledge of gardening. I would love to learn more about the Ruth Bancroft philosophy. Really nice article loved reading it. I confess! I am both a plantoholic and a plant-bookoholic. I do pretty well on the keeping-them-alive-and-happy status but I was not blessed with the creative design gene. I love browsing through my books and getting ideas and continually learning. I would love to add Johanna’s book to my library and learn from Ruth’s story and see her lovely garden. I aspire to be 108 and actively creating a garden of beauty that reflects my life – Ruth appears to have integrated her life and it’s collections into her garden and certainly her garden is sustaining to her life – these are cues to heed. I love her honesty and imagination – as well as her organization – and documentation, and wish to read more. My favorite line of the write up was Brian’s note that “When you see a plant in habitat, it’s like looking into its soul.” I know this feeling – and by my eye Ruth’s plants seem at peace in their placement…all. The few photographs presented are but a temptation – I look forward to enjoying her palettes, design development and evolution. I hope to be chosen to enjoy this gift of art. I would love to have this book to help me with succulent gardening here in Greece, where I face a hot, dry climate for months of the year. WInters are becoming dryer, the plants that thrive are the natives and any that can live without the promise of rain. Yes, we do water , but raising drought resistant varieties is my goal here in my garden. Bold fits this landscape and my idea of design for the plantings around my home. This looks like a beautiful book. I have been converting my yard in Escondido to succulents since the wildfires of 2007. My entire back yard was consumed by the fire, losing all my shade trees and also my irrigation. This seemed like a perfect time to convert to where i only irrigate what we can eat, and a very few landscape plants. I continue to convert one area at a time to succulents, frequently referring to Debra Lee Baldwin’s wonderful book, “Designing With Succulents”. I think this book would be a great partner to this. Thanks for the wonderful u-tubes you share with us. After seeing photos in books and magazines of the RBG for over 20 years, it’s time to see it in person! Until then, I can see this book being a treasure in my collection. Looking forward to retirement and developing more of a succulent hobby. Love the variation that a plant can form around a rock or a display item. Need help with more creativity. I’d love a copy of this book because I need all the help I can get. I would love this book. It is not so easy finding quality books in Australia about succulent gardening. We are pretty new here in West Australia as to how many plants are available etc. Fortunately some clever people have worked out ways to get them imported.. and now this state is starting to explode with these beautiful plants.. I really, really, really would love to own this book. I had it written down a couple of weeks ago, from something else I read, but hadnt been able to source one. Please please please.. send to Australia. I will share information from it with other succulent gardeners I know. Nice review. This looks like another wonderful book that designers can use to educate our clients with on the beauty and diversity of using cactus and succulents in the garden. Beautifully photographed and passionately written. We are lucky to have this garden and these wonderful people in our lives. I LOVE succulents and am fascinated by where they all come from. I grew up in Newfoundland and now live in California. Earlier this year, thanks to my boss’s love of succulents, I started reading up on how to grow them. I bought Debra’s book Succulents Simplified and started my journey/quest to become knowledgeable enough to “paint” my gardens with succulents. The driving force was the state of our water shortage and the need to make the necessary changes to the way we plant and maintain our yards and gardens. I am a watercolor artist so the visual is very important to me. However, trying to learn enough about what each plant does, colors, size, needs, etc., has been overwhelming and I want to know it all now! 🙂 Because I am visual, I believe my best mechanism of learning is to see the plants as they grow naturally so I can plant them together in the best, most complimentary and strategic way. I would love to have this book to help me do that. It sounds like this book would be a wonderful trip to take with Ruth with the aid of Joanna’s beautiful photographs. I visited the garden during the winter several years ago; it was amazing; would love to have pictures of it in summer glory. 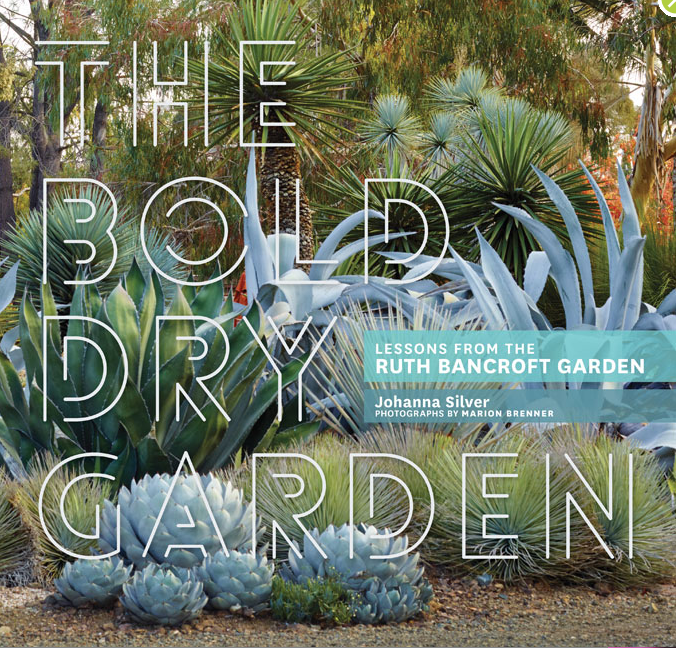 I’m starting a garden here in San Diego at age 76, so Ruth Bancroft starting hers at age 63 is an inspiration. It would be great to add The Bold Dry Garden to my collection of books. I already have all the books by Debra Lee Baldwin. My entire yard is all cactus/succulents and it’s always changing. Would love to see some new ideas. I have heard and enjoyed Johanna talk in the past and, about ten years ago, I visited the Ruth Bancroft garden. My camera batteries died halfway through the garden! I’d love to have the book and see what I can only recall in my mind now! We met our first succulent at Waterwise Botanicals in Bonaell, Ca and have been going back year after year to re fall in love with the beautiful gardens and learning experiences they provide. They have replaced orchids and azaleas as out #1 passion. We are anxious to see you new publication and pour over the pictures of what can we look forward to planting. I am New to Succulent Gardening ! Living in the Midwest – We are limited to the access of Succulents . We can get common plants but have to order any of the Fsncy Succulent Plants . I live in Fair Oaks, Calif. As with most of California these days we are in need of saving water. What better way than to replace my front yard lawn. I am a member of the Carmichael Cactus and Succulent club so I have some knowledge of what plants to use for replacements. However, I would like a bit of help with that and I have a feeling that your new book will do just that. I would love to be included in the drawing for that book. I have all your books and consider them the very best on the subject of Cacti and Succulents. I often use them for inspiration. Thank you for coming our with another, I look forward to seeing it. Birte Harley…a fan of yours..
Hi Debra! I am a big fan of yours and have all of your books. Love them all. I live in central Florida where the weather can be challenging for a succulent lover. Between the summer heat and drenching rains, my succulents struggle to overcome the elements. Your books have been a wonderful source of information and help to me. I’ m so envious of the wide variety and availability of succulents that you have access to in California. While I would love to make one of your workshops, I content myself with your videos (thank you so much for making them available to us) and perusing your books over-and-over again. I would love to have your new book and having it autographed would be wonderful! But you can be sure that it will be added to my collection one way or the other. Thank you for all that you do. Thank you Debra for this opportunity to win a copy of THE BOLD DRY GARDEN. My garden has become bold and drier since I bought and read your first book DESIGNING WITH SUCCULENTS after meeting you at Patrick Anderson’s garden. His garden was on our Fallbrook Garden Cub tour that year. I became so inspired after reading your book that I completely transformed my dreary front garden…took out the weedy grass….added some stones and paving here and there and planted succulents . I have since added and continue to do so with the help of our Fallbrook Garden club succulent group. I have enjoyed your emails and website through the years and look forward to more adventures in gardening with succulents. Gophers don’t like them (mostly), drought doesn’t phase them, easy to propagate, fairly quick growing – what is not to like. I really would like to win you book. I definite have areas in my landscape that could use help. I am both a gardener and Succ-aholic. I have visited and purchased specimens from The Ruth Bancroft Garden. I cannot think of a more amazing garden story than that of Ruth Bancrofts. In a time when boldness and courage was not on the female virtues roster, she was a pioneer. Gutsy and brave and not content with the mainstream pansy route. She saw the beauty in the dry landscape and brought it and a lot of plant knowledge to millions thru her toils creating the incredible garden we all can visit and drool over, as well as the wisdom and experience she imparted dry scape novices and wanna be’s with the help she offered the local community with her newspaper articles. She was sustainable when sustainable wasnt cool! I would love a book about this grand lady and her creation and legacy! I would lovevto have that book! I would love to have this book, it would help further my dream of working with plants. You can never have too much knowledge. It would just be a great addition to my collection. Thank you for the opportunity! …Why? because who doesn’t get enthused reading a great book about PLANTS! I need some inspiration to redo my front yard after letting the grass die 5 years ago. Neighbors will be happy 😉 MUST make it lovely to make it up to them. Apart from sharing a given name, I’m a bit of an obsessive plant collector too, I believe when you want to know more about something you should seek an experts view, a growers opinion and not a generic one. I would love to add this to my collection of plant books! I don’t have many books on succulents, but I’m obsessed with them and keep trying to expand them in my garden. It’s difficult in the wet Pacific NW, so many are inside. To learn as much as I can from experts because I would like to turn this plant design love into a career not just a passionate hobby ? Would love to win the book – want to turn my front yard into a succulent garden. Many thanks for the opportunity. I’m always looking for succulent garden inspiration and this book looks like it’s full of ideas and inspiration. I would like this book because I love succulents. I would love to win this book and learn how to turn our 15,000sq ft property into a heavenly succulent haven! I’m from WI but live in NM now. I would love to learn about gardening in this area & I am exploring succulents , would love to have this book…please & thank you. Happy growing!! I would love to win The Bold dry Garden. I am constantly sharing your books with my neighbors, trying to get them to convert their lawns into dry gardens to conserve water! Hi Debra!! I first tell in love with succulents when I came to watch you at the Paul Ecke show at San Diego county dair. i purchased one of your books right then and hhard your autograph. I love your passion for these plants they are amazing beautiful resilient plants and I now own hundreds. Thank you for sharing with us and I would love to own another one of your books they are awesome!! I started to read this book while visiting a Barnes and Noble bookstore in Long Beach. I fell in love with the book and Johanna’s narrative. The life of Ruth Bancroft and her habits is captivating. I would love to finish reading the book and then vivit the garden.